"Pandy-less lady!" That's what I quietly called her while I relished lifedrawing session with a little feeling of vertigo. Sketch pads fluttered like broken kites up rooftop of friend painter-musician's lofty abode. 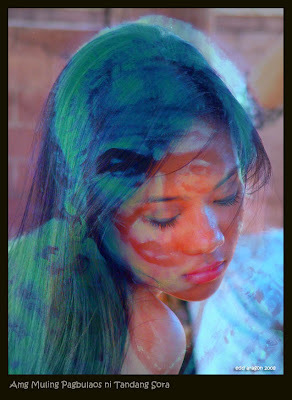 She was our model, 19, a true blue Filipina, slim with a confident, catwalk gaze. But Pandy was not around to sketch with us. Hasn't he been up here before? Is he acrophobic? No, not Pandy Aviado, also Dipands to many friends; he must be so used now to achieving cultural heights, labeling him an acrophobe is out of the question. I remember his works surging up, as literal as his murals on tall buildings in Manila in early 70’s, his wonderful prints which I think are more mystically entertaining than Paul Klee's; and see him from a different qualitative plane for he could be a gentle, flowing water that fashions stone. Wonder if he can shift his chi so skilfully now. Power points; that's it, although not your computer presentation kind. They're mere information I've polarized from reading yoga and esoteric books (among them written by Edgar Cayce, Carlos Castaneda, Deepak Chopra and Barry Long) and they all point to one thing..power points in our bodies that we could move specifically for an intended function thru intense focus. Some martial arts masters have confirmed this after making gravel out of solid rock in one blow. However scientists couldn't explain the phenomenon and treat it just like hot prana. Pandy introduced me to a lot of opportunities to ponder upon. There was also this plane of existence he thought was a good playground and shared to us by his prints that looked influenced by the Vorticist movement in Germany in the 50's; and yet his style is somehow subtly disciplined by the so-called Golden Ratio. He also must be wretchedly busy for not joining us today. Why, didn't he know we’ll have a pretty model? (Pareng) Heber has worn out his celphone keys sending away messages searching for a professional; he Eureka'd one and excitedly invited other artists to join us. There was even that popular singer of the 60's Victor Wood who I earlier met in Sydney. Creak...squeak..the crowd tested integrity of wooden floor. 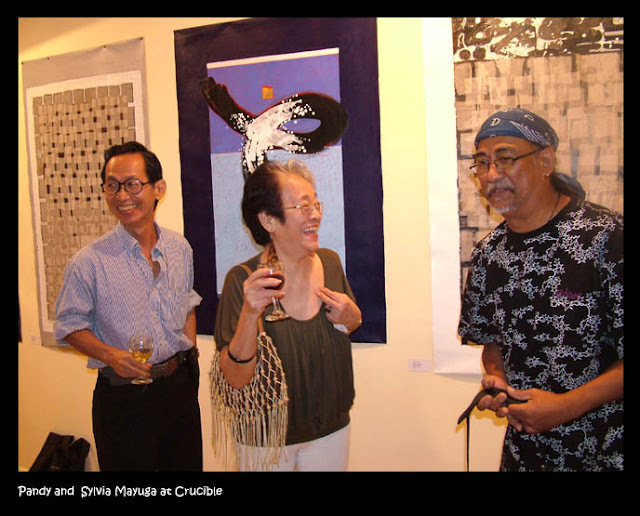 Below, guests arrived in small groups to attend opening of my Mulat (UV Invisible Art Exhibit) at ground floor. Nice to know Reuters has distributed video world-wide; even in Austria! There were media people, smart-looking guests, Heber and Margo's neighbours with children; and even grandchildren of Tandang Sora. 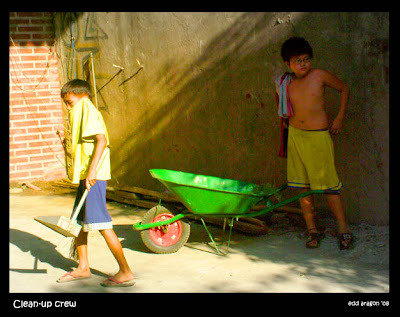 Earlier I was totally bemused by these kids who walked past me like Buddhist monks laden with light loads; they were magically luminous and light shimmered as they lifted and lined up buho (hollow, bamboo-like reeds) against a tall, concrete wall. 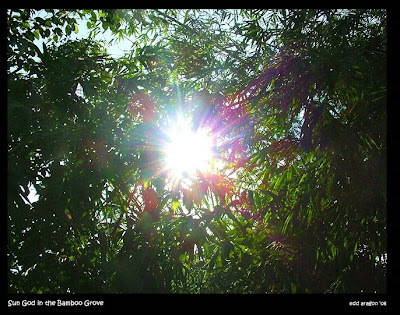 No wonder, I found out bamboo trees nearby filtered the shafts of sunlight on the children. It was like a flickering strobelight but beams were of rounded form, like flat bubbles and not squares and pixelated as in the digital world. Natural light I thought always dig deep and where it can't bounces off and creates that transparent marble glaze on the surface guised as natural colour as rejected by the object's spectrum. 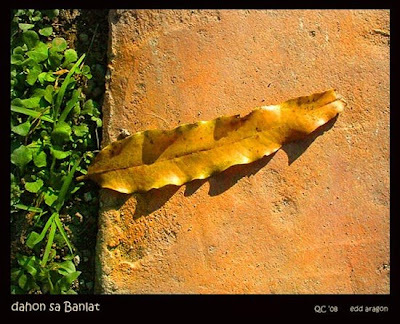 How come human skin under late afternoon sun has that tangerine glow so hard to mimic using man-made pastel sticks? A kind of luminescence that glows deeper down where almost half the intensity of sunlight gets absorbed..and perhaps reason why sometimes we could see blood vessels underneath even if only looking at a painting by Caravaggio. Layering in transparent colours might be the key. I fretted, maybe I should go back to oils and watercolours to achieve this quality. I used to tell my students, when approaching colours, don't perceive shadows as just black. Avoid black! Mix in all the colours in your pallete to achieve your darkest. To illustrate, mix the blue you use for your sky and the colour of sand you're using, and you get correct colour of shadow of that beach umbrella without introducing a strange tint, that's generally speaking. During one session pose, serendipitous as it was, shadows revealed more than they hid, and it hit something inside me, a bit unsettling upon recognizing I was also a shadow mixed in from the blue of Philippine skies and the red hues of vast deserts in Australia. For a brief moment, I missed my adopted land. “Hey what’s the big deal about this old woman? Why is everybody so busy?" "Ssh, she's there inside one of those white paintings..maybe a ghost, and Sir Heber said we'll see her tonight!" "A ghost?! You kidding me?" Suddenly I was taken aback by a dark, furry thing that brushed on my leg. It was Phantom. Phew! He's Heber's forever loyal canine. Finally it was night time and someone flicked the switch on cue! The nocturnal black jelly vignetted the glowing windows of ephemeral blue. The ultra-violet lights were finally on. Why, I never realised those paintings were more brilliant with Japanese brand UV tubes. Chinese-made ones rarely deliver the correct intensity. Flash units of cameras fell silent, and while normal light crept back, dark sillhoutes of guests milled around the glowing canvases. I was floating in an ethereal blue light where the spectators were now who couldn't be seen. Most unseen were efforts put in by people who were behind this UV show, I thank my partner, my siblings, relations, friends and comrades. Kids blood-related to Melchora Aquino (aka Tandang Sora) cut opening ribbon; then applause and followed by short speeches and musical performances from Heber, his brothers Jessie and Levi, Gus Albor, and many more. Damn, where's Dipands? He's missing this all. Heber texted him, he's running late. Later there was a musical jamming which I later joined in. I was in a blissful trance as a pretty media personality cornered me beside a UV painting of Andres Bonifacio. "Please let me sketch, too!" was on everyone's lips. Pandy lives just 5 minutes away from this wonderful penthouse studio; airy, 360-degree panoramic view and perhaps highest structure in Banlat. 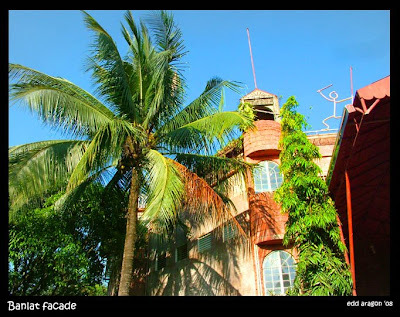 Heber's house (or Bahay ni Heber as he prefers it) is a multi-level brick palace with concrete tree sculptures hugging the walls and arched doorways much like rubber tree vines strangling temples of Angkor Wat. 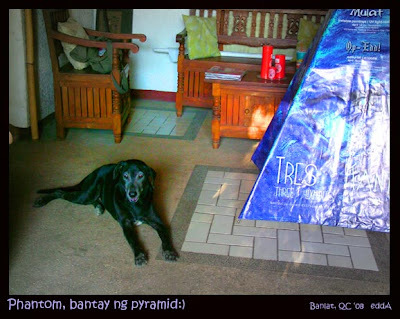 Where I was, I could see rugged Cordillera spine of dear ol' homeland, a series of blue vertebrae traversing Luzon. I'm home! 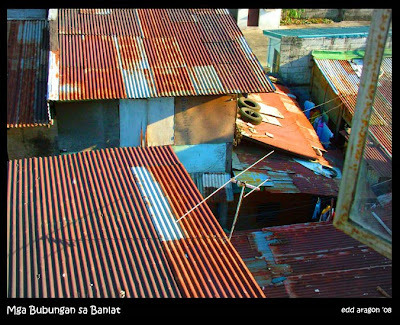 Through Banggaan Art Group photo/email exchange I was able to follow magical transformation of Heber's yard and studio. Pakaskas is also a sweet delicacy I found being sold in Batangas where I bought a cluster soon as we arrived by boat from Puerto Galera. How I miss this childhood snack..it is Philippine nectar to me, not as rough as arnibal or panutsa (a solid, half-sphere of crude sugar) nor "metallic" like refined sugar. 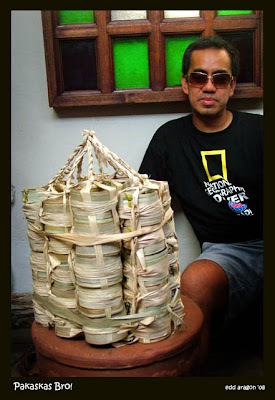 Pareng Heber egged me to “Buy the whole cluster, it is installation art!” Laughing I said “I’m gonna buy it all right but not the whole, huge cluster made of woven coconut leaves (what genius! )!” I conceded anyway and brought home whole pagoda of a nectar trap in Pasay. Younger sibling Ricky loved it and even posed with pakaskas chandelier. Like honey, it took time and process to create, sourcing hundreds of blooms of experience through trial and error. It's like lifedrawing, I guess. The sweet thing comes in later. 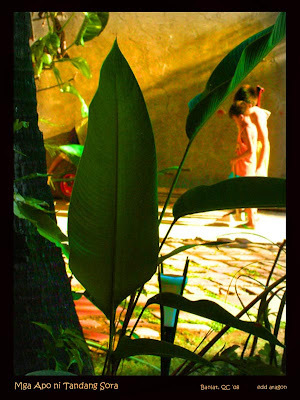 At that moment our model was nectar, with artists like palm leaves woven around. Hard to concentrate on drawing when there are distractions but one gets used to it. My stomach for one, oh how I hoped to eat one of those pugon-hot pandesal clamped on a large lump of noodles. The model shifted position, reclined this time. With hunger pangs derailing my focus I perceived myself as a living mass of enzymes ready to attack starch, a pencil for a fork. What dilemma! Still no shadow of Pandy. I remember, just about in middle of lifedrawing session where model reposed, there was a change in humidity, air stood still. Funny I thought, as muffled silence revealed sweet rhythms of scrawling and smudging of art sticks. She was now bathed by Manila’s gentle afternoon sun; smudged by soft pastels of tangerine luminosity; alluring as she again gently disrobed. Soon she settled with a restive pose and artists became bees around the queen. Model and artists soon were one. Synergy can jolt spirit. Model passive, artists active...perfect, I murmured. She was core of wheel, a hub seemingly unmoving even if it turns; exuding radii which connected to our drawing hands and latched gently to spirit. Whoa, that was when I felt a series of static electricity ran up my spine as I gazed at her. She was afterall Tandang Sora reborn as beautiful youth, still passionately caring to warriors, this time of the arts, even if only to lend her beauty for a few hours. To my left I heard a soft, wavering sound and turned my head. Was it her robe? Did the wind blow and snag it up that...err.. tv antennae? 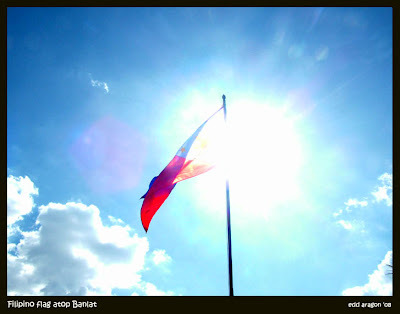 No, I was just blinded by the sun, it was a proud Philippine flag installed by Heber on top of this historic building. I finished a few drawings as I got aware of time to tell model to shift poses. 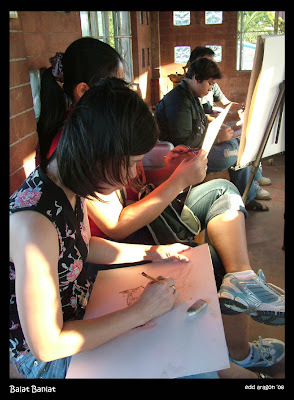 I noticed a strange contrast of lifedrawing event and a detached scenery below as I sharpened a broken red pencil. Heber’s palace, after all, is ringed by a beautiful mosaic of middle-rich green and rust-red rooftops segregated by lush fences of fruit trees. Looking down northern end of loft, shanties with roofs weighed down by rubber tyres and odd-shaped steel bars; and were superimposed doodles on an abstract, static face with a rusty grin as if to say "we're part of whole, too you know." I'm surprised I can still easily spot a caimito from mango or cheza when foliage is viewed from afar; i.e., even if I've spent more than half of my life in Australia where native foliage is loose, leaves more dispersed and left airholes, trunks and limbs hardened by extreme climate changes. Nary a fruit tree around. The aboriginal people gather black berries in shallow wooden barks and partake on them after hours of gathering. Nothing compared to our native blackberry called duhat. Bigger, sweeter and Filipinos claim it is good for diabetes! Shake in some sea salt until the fruit blister and Bob's your uncle! An Australian gum tree would remind me of Pandy. Tempered yet adaptive to climate change. 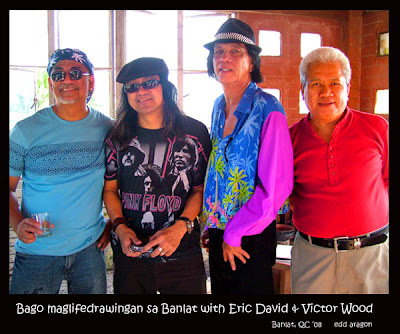 I've known him for years , introduced by Nonoy Marcelo in early 70's. 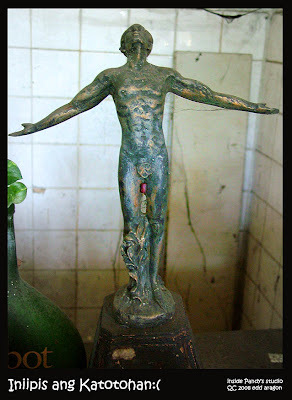 During that time I was surprised Nonoy, (who always worked alone, quiet as he was even in my presence and rarely blurted out nonsense) moved around in a small but magical circle of friends, mostly writers and artists. I thought I didn't belong and rarely went out with them but Nonoy, Santi Bose and Pandy liked me and so Ermita opened up like a new planet to explore. I hang around there, day and night. In cafes I cooked up ideas for my daily comic strip SIC. The place never seem to run out of chatty American tourists. However I did prefer daytime browsing in Ermita, palming prints on squeaky glass doors of bookstores and curio shops. Many times I was inside dimly-lit antique shops while I was quietly mesmerised by ashened Hispanic saint heads. Some objects in glass cases were mere ivory extremities. Ooh that one I was sure cost an arm and a leg. "Still creating lumps" in the arts' fabric I thought of Pandy when I saw him again. 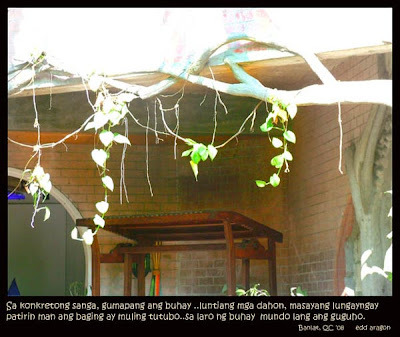 It was late in '78 when Pandy and I became co-editors of Bukol Magazine (published by Nonoy). I just can't believe guy was such a good sport! 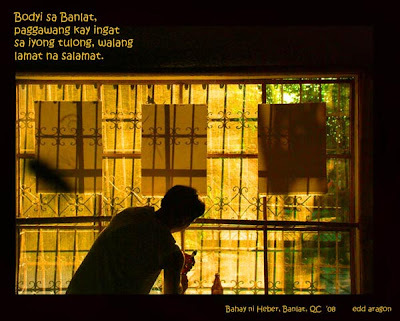 A respected printmaker doing comics for Bukol? Artists are a playful lot however subtle. 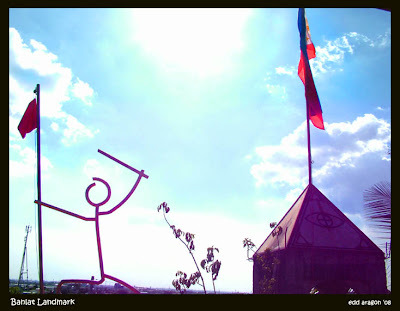 Maybe Bukol was comic relief or outlet of Ermita (an intellectual magazine that lasted 10 issues. 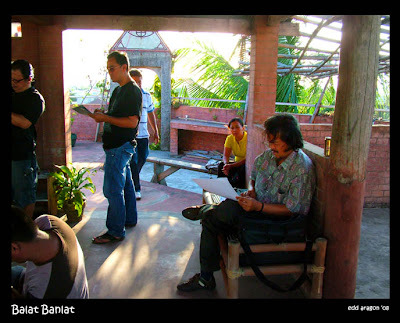 Pepito Bosch was main pen gun and Santi Bose, art director. 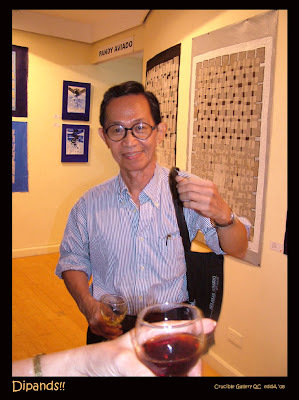 Pepito is uncle of Anabel Bosch who incidentally runs Oarhouse in Malate where one of my three art exhibits opened). Flexibility and adaptability are keywords, I thought that's where artistry really begins. Fun! 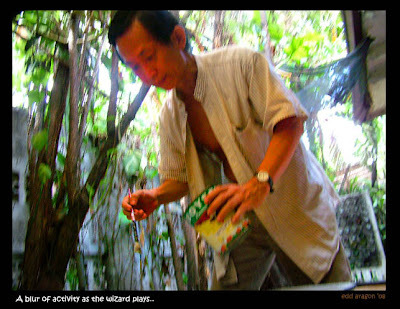 He enjoyed being an artist first and then knew the rules of the ball game in the Philippine art scene. A balance is achieved somewhere where he can still keep an aura of solitude while obsessively working to let his demons out; as if each painting is a portal for his artistic mind to curiously explore. Aah, his comics were of mental events that could only possibly come from a strange plane of existence, sort of “are you the dreamer or the one being dreamt of? ); but his style and intent are well in signature. Not a warty chameleon as he would have more chromatopores than a cuttlefish, always productive enough to blow printer's ink in the deep, blue, art scene. He drew comics with a satirical blade and a sharp quill or felt pen, akin to a stylus for printmaking. It was a storyboard from hell! LOL! 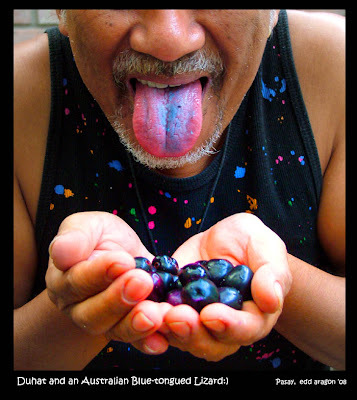 When Nonoy died six years ago (b.1939-d.2002), It was Pandy who broke the sad news. His email was screaming with sorrow, a simple invective of a line that broke my heart. "P....na! Ba't siya pa?!" I stood cold. My Ninong is dead. That evening in Sydney a red moon hid behind leaves of thirsty eucalyptus trees as I took gulps of chilly, dry air; knees felt like rubber as I attempted to play his favourite Bob Dylan song (now where’s that blessed cd!?). But then maybe I played a Vivaldi he loved. Damn! The Master was gone, forever silent. It’s so premature; Nonoy was still young at 63! We still all wanted to see him paint, right?! I consoled myself that his sharp pen and sacred scribbles will anyway be part of Philippine culture, an added radius to the Akashic hard disc. I had chance to surprise Pandy earlier at his Fil-Am village home and he was ecstatic to see me. A little gift of wine prodded a bigger smile on his clean-shaven face. He seemed resistant to aging, lanky in his energetic and in anthro-speak..Sino stature. “It’s good for your heart!” as I plopped cask on his paint-stained hands. Outside, my eyes caught a glint of green bursts of crystalline light. 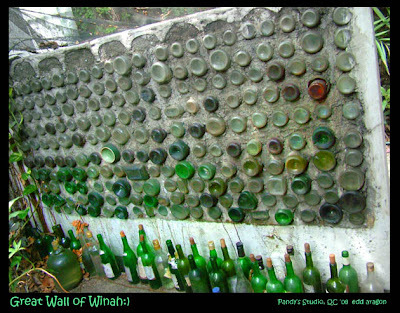 There still was his wall built with wine bottles and concrete but he won’t be able to include that Aussie red in a cask and tinfoil bladder. Air was strange. He never smoked ciggies but a friendly haze in his studio must be coming from an aromatic incense that defied planetary politics. Any small talk however was rebutted instantly by his silly puns. Is this his interpretation of Goethe’s : “Work, artist; don’t talk!”? And did someone describe him as a wry maestro of dry line? More of dry throats, I reckon, as he sipped on a red. Maybe nothing's too serious inside his studio, not even those small, humanoid-like skeletons trapped in a flimsy birdcage hanging outside his porch. It then dawned upon me Pandy had created a 3-dimensional editorial cartoon...installed, intriguing, funny, surreal , interesting and decorative. Oh what could the issue be about? Futility of freedom? Death trapped? 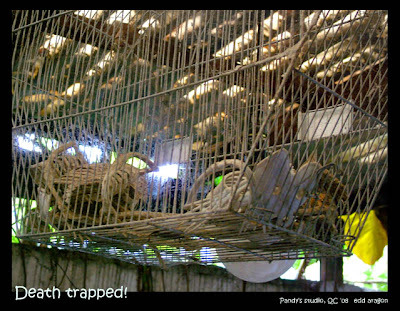 Caged Mortality? Meanwhile Pandy worked in his enclosure while he showed me a few of his works drying up. "Craquelure effect!" I blurted out. "Uh-huh, so you knew!" he quickly retorted. "Well too bad.. enamel and acrylic just don't mix; or was it sudden temperature change that did the trick?” as I tried to inflect a tone of affectionate sarcasm. 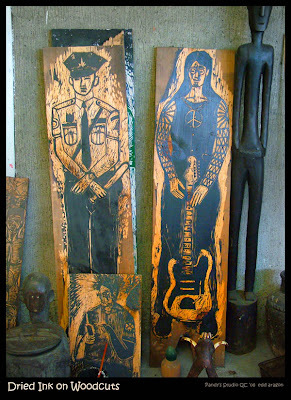 I never tired of looking around his studio as visual turned to mental. Many times we ran across names of friends back in the 70’s. 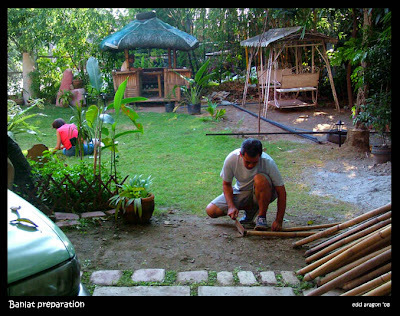 In 1998 I came home briefly to Manila to bury my old man. Pandy meanwhile arranged to meet at CCP Printmaking studio where he showed me around and got introduced to his printmaker friends. He then invited me to his studio where he quickly drew me a portrait. Overwhelming! 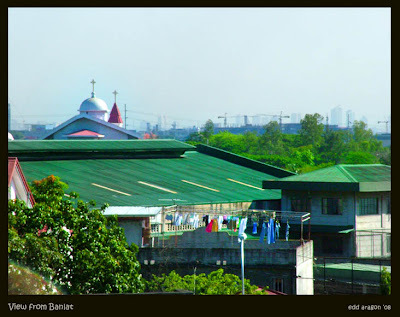 Sight, sound and smell of Manila (to include Pasay, Makati & Quezon City). I took strange photos from open roof of brother's Ford Escape. Skyscrapers under construction with boom cranes lit up like a Christmas tree. Dizzying sometimes as I get used to traffic culture and those U-turn déjà vu sections along major roads. Soon I found mysef at the opening of Pandy’s show at Crucible in Megamall, Quezon City. My first time in this huge place with galleries lining up whole floor so invitingly like old friends who turned up from nowhere. Aah, Pandy, he finally arrived. It's a been a long wait but to see him again was one of joyful moments in Manila. Good on you Pandy, may you live forever while having fun working (like every good brujo should:)! 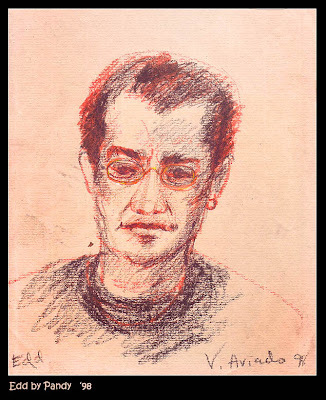 Pandy Aviado is a renowned printmaker, visual artist and writer. He authored numerous books. 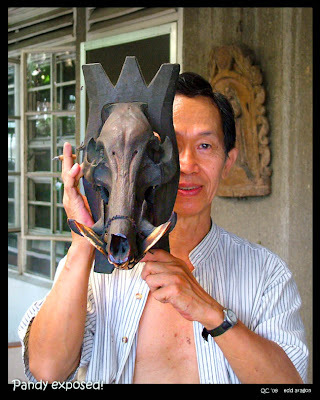 Born in 1944, he won first prize in 1964 Shell Art competition in the Philippines at the age of 20. 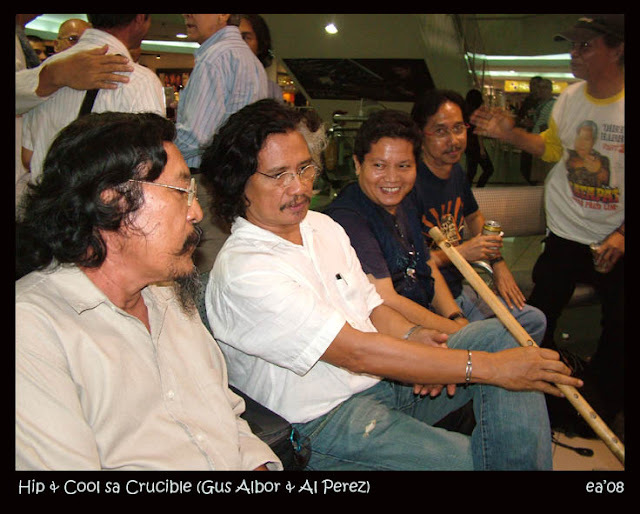 He's a former Director of Cultural Center of the Philippines and dean of PWU Fine Arts.